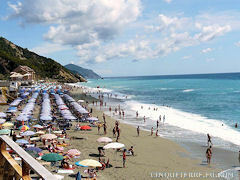 Deiva Marina is a small seaside resort of the Eastern Italian Riviera and a very good starting point for excursions to the famous Cinque Terre and Portofino. This small village has a beautiful sandy beach with crystal clear waters. The town is divided into two parts: the old town with its narrow streets and old typical houses and the tourist area called la Marina, with its seafront, shops, restaurants and the beach. The surrounding green hills with olive groves and spectacular sea views are perfect for hiking. In Deiva Marina you will find several hotels and camping places. • The old town and the medival houses. • The Church of Sant’Antonio Abate built in 1730 in Baroque style, with paintings dating between the ages XVIII and XIX. • Worth seeing is also the ruins of the old castle of Da Passano. 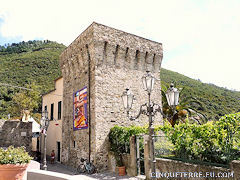 The Family da Passano governed the area around Moneglia, Vernazza and the Bracco until 10th century. • The rests of the two old sight towers defending the town from pirate raids.